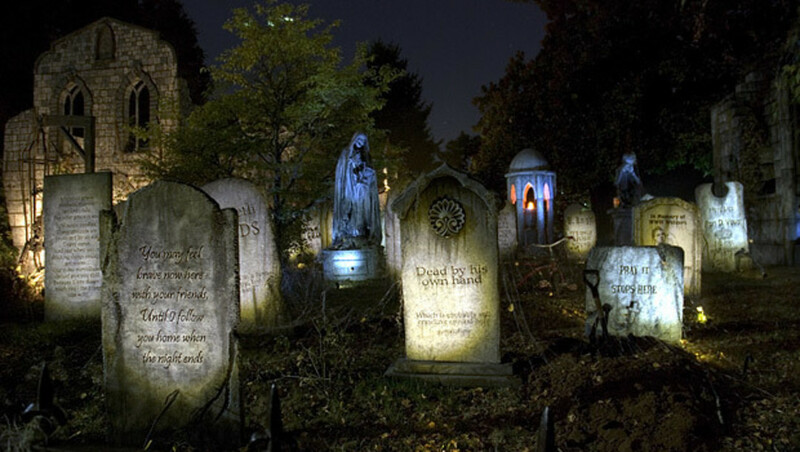 Pack up the whole family and head for Portland's spookiest spots this Halloween season. Don't have kids? Check out our Halloween guide for adults for the best parties, macabre theater productions, and comedy events. Named as one of the scariest haunted houses in Oregon by Haunt World, Fright Town boasts not one but three haunted houses: Baron Von Goolo’s Museum of Horrors, known for its combination humor and horror; the Madness, based of the writings of H.P. Lovecraft; and the Witch House, the all-new haunt...and the scariest. Fright Town clearly implies your kids might need therapy after this one, so beware! Family friendly costume fun that began as a flash mob is now held annually. Follow a few rules­—hands to yourself, no scaring non-participants, stay on sidewalks, no littering, no alcohol outside and no drugs—and you are good to go haunt the night. Exploring the two miles of Portland’s original maize maze is tradition at Sauvie Island’s famous Pumpkin Patch. The whole family can lose itself in the cornfields by day, but after night falls, the mazes come alive as haunting corridors of fright. This haunted maze, stalked by more than just corn, waits to swallow you up at every wrong twist and turn. Wear weather-appropriate shoes and clothing, in case you lose your way in the cold or get stuck in the mud running from zombies, vampires, and other creatures. Bella Organic also host hayrides, corn hole, and warm bonfires, so spend the day out on Sauvie Island’s wickedest farm. Fire dancers! Hoola-hoop artists! Outdoor film and live music! Visitors can buy a Pumpkin Package deal, which includes two maze tickets, pumpkins, caramel apples, and roasted corn. Obsessed with Halloween? Sure...but not as much as the Davis family, who has spent the whole year transforming their home into one of the scariest destinations in Oregon. With more than 70 hand-carved tombstones, a three-story abbey, and projected ghost affects, this display-only, kid-friendly haunt is an exciting spectacle for the whole fam. Visit on All Hallow’s Eve to watch and support the Milwaukie Night School Dance team, which will perform Thriller every half hour until 9:30pm. Like what you see? Sign up next summer for workshops where you can learn to replicate some of the fun and frightful props. As if zip lining from the treetops at 40 miles per hour wasn’t already a rush, imagine it with zombies! At Tree to Tree Adventure Park's Zombie Fest, guests are invited to show up in costume, sip hot chocolate, roast s’mores on a campfire, and try out the new Tree Top Plunge. Man Bites Dog will also be on the scene, dishing out German Sausages and other treats. Before the big night of trick-or-treating, bring the family (in costume) to the Portland Columbia Symphony for face-painting, crafts, a photo booth, and a petting zoo. At 4pm, join a “safari” through live orchestra, where guest conductor Bruce Walker will play music by Mussorgsky, Grieg, Bartok, Weber, and John Williams. The Sorcerer’s Apprentice will be performed by Tears of Joy Theatre puppets, and pop classics will be sung by the Symphonic Girlchoir. Send off the Halloween season with the entire family! This is you and your kids’ last chance to show off costumes while dancing to themed music by DJ Brokenwindow, swapping sugary sweets and admiring the jack o’lanterns. “It's the Great Pumpkin, Charlie Brown” will also be screened, and all funds go to Hand2Mouth’s next project.